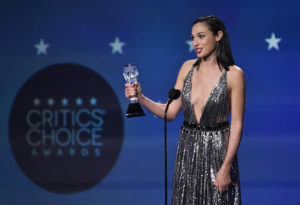 What a joy to attend the Critics Choice Awards on the heels of the women-driven Golden Globes Awards earlier in the week, as women across the globe were inspired by Oprah’s Cecil B. DeMille Award acceptance speech. 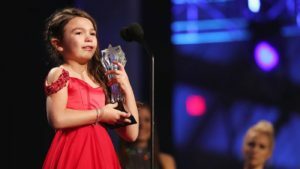 The mood Thursday evening, January 11, 2018 was exciting to say the least. Everywhere you looked, women−whether celebrities or critics—were beaming. Yes, the room was euphoric in celebration, as finally our voices have been heard. 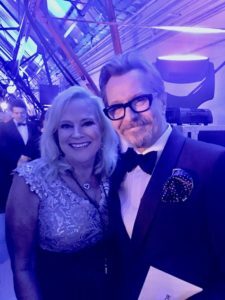 Sarah Knight Adamson and Gary Oldman (Best Actor) “The Darkest Hour” Backstage at the Critics Choice Awards 2018. 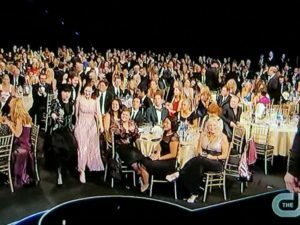 Cast of “Big Little Lies” Critics’ Choice Awards at Barker Hangar on January 11, 2018 in Santa Monica, California. 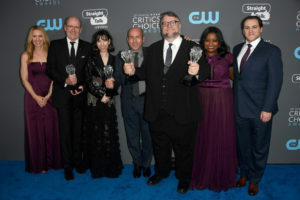 The cast of “The Shape of Water” poses in the press room during The 23rd Annual Critics’ Choice Awards at Barker Hangar on January 11, 2018 in Santa Monica, California. 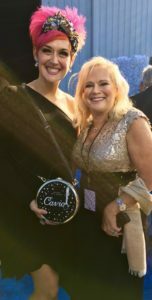 Grae Drake Senior Editor of Rotten Tomatoes and her ‘Caviar’ purse. 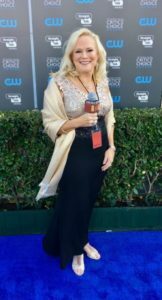 On the Red Carpet, Critics Choice Awards 2018. 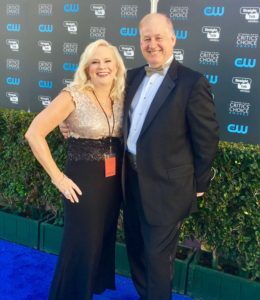 Sarah Knight Adamson with her date for the evening her husband Bill Adamson…on his birthday. 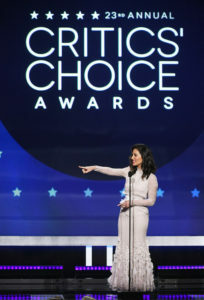 Critics Choice Awards 2018.